Interpretation of satellite imagery holds promise as the method to pinpoint early development of potentially toxic cyanobacterial blooms in water sources. The technology could help drinking water providers save money on treatment and avoid the pitfalls of dealing with this problem. 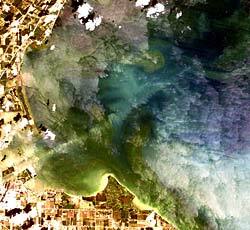 Robert Vincent, a professor of geology at Ohio’s Bowling Green State University (BGSU), developed an algorithm to find and forecast algal bloom growth based on analysis of LANDSAT satellite data. The National Oceanic and Atmospheric Administration (NOAA) in August awarded a $349,000 grant to the university to continue research related to monitoring water quality in Lake Erie. Cyanobacteria, although widespread in water sources, can produce certain types of toxins that are harmful to humans, mammals, and fish. Sometimes referred to as blue-green algae, cyanobacteria flourish under certain conditions, such as in areas polluted by phosphate waste. A 2005 study by University of Arizona researchers identified a neurotoxic amino acid, ß-methylamino L-alanine (BMAA), as the possible cause of amyotrophic lateral sclerosos/parkinsonism-dementia complex among the Chamorro people of Guam. BMAA is one toxin produced by cyanobacteria and also has been found in the brain tissues of Canadian Alzheimer’s patients. There are two ways to deal with the blooms: kill them with chemicals added to the reservoir or disassociate the toxins that make it into the water treatment plant. The latter is done with chlorine, but many different types of chemicals have come to the market recently for killing the blooms, including chemicals that take phosphate out of the water and deposit it at the bottom in a form that cyanobacteria and other plants cannot make use of as a major nutrient. Vincent’s background in remote sensing technology began with work for a company involved in oil, gas, and mineral exploration. For nearly 20 years, he helped this company find such resources based on analysis of satellite images that reflect multi-spectral bands of reflective sunlight from Earth. In 2000, the geologist turned his attention to algal blooms and finding a similar forecasting model for this problem. “I was interested in them because geologically they are important. They added oxygen to the atmosphere a few billion years ago,” said Vincent of hardy and prolific cyanobacteria. On a day when the satellite passed over Lake Erie, Vincent’s team took 30 water samples and analyzed the water for cyanobacteria, or more specifically, for the amount of phycocyanin content, a light-harvesting pigment in the bacteria. “I collected those samples from a University of Texas research vessel and my co-investigators at the BGSU Department of Biological Sciences measured the amount of phycocyanin in each of them. Then I tried almost every possible combination of spectral bands to see which one did the best. That’s the one I chose for my algorithm,” Vincent said. Bowling Green’s cyanobacteria research for monitoring the Great Lakes, now in its second year, will attempt to determine what makes certain strains of the bacteria turn toxic. Last year, university researchers working under Dr. George Bullerjahn developed a strain of Mycrocystis cyanobacteria that would glow when scientists activated a gene that produces the bacteria’s toxins. Scientists at Heidelberg College, the University of Toledo, and Central State and Cleveland State universities also are involved with the project, focusing on analysis of algal blooms in Lake Erie. “It is important that Americans understand that this is not a regional problem—the deterioration of the Great Lakes affects the country as a whole,” said U.S. Sen. George Voinovich, ROhio, who helped secure the NOAA funding through the U.S. Department of Commerce. Voinovich is a member of the Senate Environment and Public Works Committee. Peaking in September or October, this year’s blooms at Lake Erie might be the biggest ever, owing largely to warm weather and heavy runoff of nitrogen and phosphorus from farm fields into the lake’s tributaries, Vincent said. “We’re having an upsurge in cyanobacterial blooms, and we think part of the reason is global warming and also because there are more nutrients in the water,” he added. While a typical drinking water treatment plant’s filters will capture and keep cyanobacteria out of treated water, Vincent said they do not filter out the chemical toxins in the water. Dispensing other chemicals to a large algal bloom prior to uptake into the treatment plant may deplete oxygen in the reservoir, which then can lead to other chemical problems. It also would require a greater volume of chemicals to kill a large cyanobacterial bloom than it would to kill a small bloom. “They don’t want these blooms getting big for a variety of reasons. Finding them early enough to do away with them while they are small is a useful thing,” Vincent said. For more information on this process, you can contact Vincent via email at rvincen@ bgsu.edu.